I first devised the modified sestina in the early '90s when I wrote "Degrees of Hell at Hattiesburg." While the poem retains aspects of the traditional sestina, the idea was to think in terms of word endings as opposed to end words verbatim. Afterward, with an eye toward further innovations, I wrote additional sestinas, becoming progressively more playful as I developed the form, including "Last of the Rorschachs," my most recent experiment not only with the modified sestina, but also with the tanka chain. for a fill-up. Map unfurled, you ask directions. on coffee & apple pie with directions on the side. in life’s simply to treat folks polite. she cracks, painted nail scrolling for "free whey." they're closed for quote-unquote renovation. Well, that's how they turn you away anyway. take a left at the dogleg after the last light. frames the gesticulation meant for you. from the laborers at the construction site. across the way. Until now, an "oversight"
no," he protested the protesters. "I’ll make kilos!" my half-assed crown, which, like the land, now lies stripped & seared. "what unsightly vanity doth burn mine eye!" a vagrant hits me up for a cigarette. demands my wallet & says to make it snappy. of me, waves of hair like licorice whips? to hear this. Perhaps he has a history with IVTC-Lafayette. shooter with the flick of his wrist. Not wanting to sing falsetto, I empty my pocket. facto, "I hope you blow the wad on aromatherapy!" she whacks off your pet monkey. 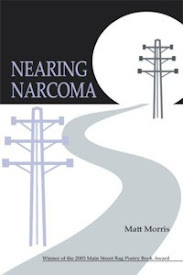 "Degrees of Hell in Hattiesburg" (orginally titled "Going Nowhere" prior to publication in New York Quarterly) and "Heroic Response" appear in Nearing Narcoma. "Sudden Realization of the Perfect Thing to Have Said" first appeared in Barbaric Yawp (2004). 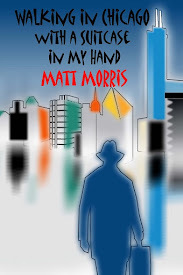 The poem also appears in Walking in Chicago with a Suitcase in My Hand. "Last of the Rorschachs" first appeared in Rolling Thunder Review.